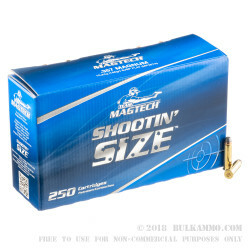 The “Shootin’ Size” box is a 250 round case lot of ammunition meant for those who take their range time seriously. This is a great bargain play for rounds that can easily pull double or triple duty for the .357 Magnum enthusiast. 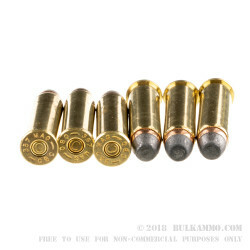 The load is a 158 grain semi jacketed soft point projectile, with a well crimped brass casing that is Boxer primed and offers easy reloadability and very good consistency in accuracy and velocity numbers. The round shoots relatively clean, and the power is high enough to knock around the steel and other reactive targets, but it is somewhat mild considering it is such a heavy grain weight and is a Magnum. It shoots slightly softer than other Magnum loads. The MagTech brand has grown exponentially since their debut in the early 1990’s and it’s because of their commitment to innovation and forward-thinking marketing and actually delivering on marketing statements. The company is part of one of the largest conglomerate producers of ammunition in the world and is a sister company to major players like CBC and MEN and Sellier & Bellot. Together they are producing nearly 2 billion rounds of ammunition per year. 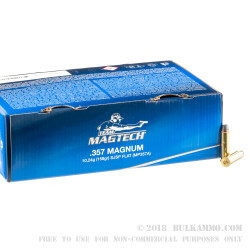 The bargain price on this 158 grain soft point semi jacketed .357 Magnum load makes it suitable for all kinds of uses including plinking, self-defense and target work. 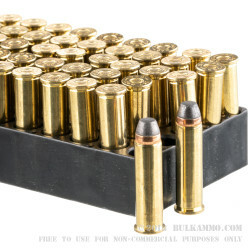 And thanks to the 5 trays of 50 rounds in the box, you’ll have plenty of ammunition to make it happen.